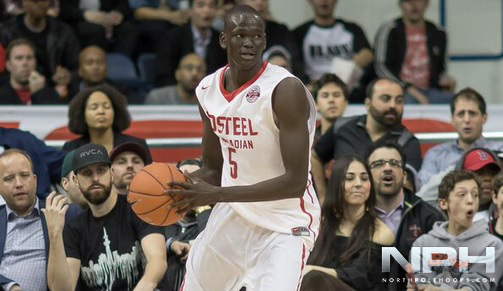 Major news broke out in the Canadian AAU world, as Thon and Matur Maker have joined Canada Elite, one of the top club teams in the nation, who kick off Under Armour Session #3 in New York this weekend. The talent does not stop there for the U17 group- Jordan Holness, Amidou Bamba, Moshe Wadley, Quinton Hamilton, Michael Asemota all provide a different element to the game. Lets be clear here. Canada Elite was already LOADED without Matur, but the addition undoubtedly takes them to new heights…as in hovering around the TOP of the AAU world, both sides of the border. Canada Elite 16s could be the best AAU team in North America…only on paper though; they still have to go out there, compete with passion and ultimately produce. “We are versatile, feeling more confident and I’m just as excited as the kids, to see how this team plays; the kids are feeling confident as well,” Head Coach Shane James told North Pole Hoops. Matur in the mix, adds so much fire power on both ends, to join arguably the Top 2017 PG in the country in Jordan Henry, along with Nickeil Alexander-Walker, currently the top shooting guard in the class. Maker will be used at the three spot, but could also assist at the four–relentless on the glass with high energy and mobility. Jonathan Kabongo is another big addition for Canada Elite, as he is one of the top PG’s in 2018, along with his new teammate Raheem Sulilvan. Kabongo already has offers from Virginia Tech and Indiana. Follow @Elias_NPH @NorthPoleHoops for LIVE coverage from New York! CYBL Grade 8 Session 2 Preview: Canada Elite, CIA Bounce and?